If you live in one of the uber-expensive coastal cities of California and Washington state, then continuing to rent is often the only option. In Detroit, a median priced starter home costs $16,463 — the lowest median home sales price in the nation. Buying is typically cheaper, but that changes when roommates are thrown into the mix. Trulia tackles this question in its latest Rent vs. Buy report, which determines the breakeven horizon for the nation’s 100 largest metro areas. In the report, Trulia assumes renters are weighing two options: 1) paying full rent for a typical housing unit, or 2) buying an average priced home with a 30-year fixed rate loan and 20 percent down payment. 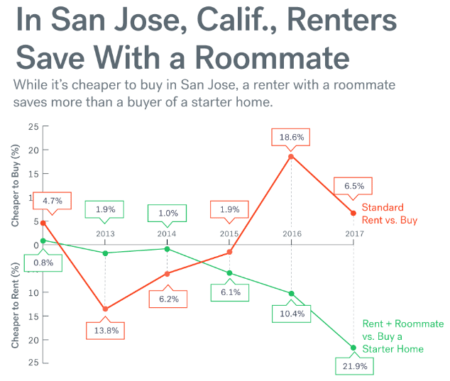 For this version of the report, Trulia Senior Economist Cheryl Young threw in an extra factor — the presence of roommates; according to a recent Trulia report, more than 20 percent of millennials live with a roommate, which represents a 115-year high. Young says although the standard rent versus buy analysis reveals buying is cheaper than renting in all of the nation’s 100 largest metros, that changes when roommates are thrown into the mix. 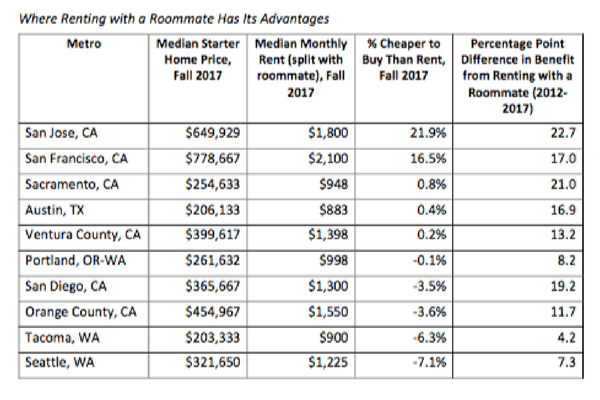 If you live in one of the uber-expensive coastal cities of California and Washington state, then staying a renter will be the best choice for you. In San Jose, Calif., renting is 21.9 percent cheaper than buying a median-priced home of $649,929. If a renter still wanted to buy, it would take two years before buying would be cheaper than renting — but only if a renter has a 20 percent down payment of $129,985. If a buyer has the average down payment of 6 percent ($38,995) it would take 3 years before buying becomes cheaper than renting. 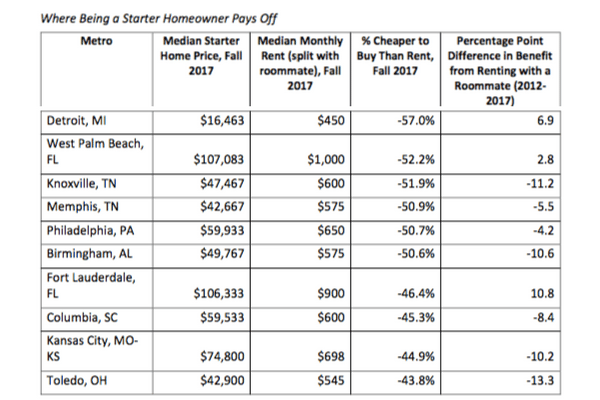 On the other hand, there are a number of markets across the Midwest and South where homeownership would be advantageous for renters. For example, in Detroit, Mich., a median priced starter home costs $16,463 — the lowest median home sales price in the nation. At this rate, even if a renter only had $1 to offer as a down payment, buying will always be cheaper than renting. There’s a catch to markets like these where homebuying is cheaper than renting: potential buyers will have to duke it out for cheap listings in the midst of an inventory shortage. According to Trulia’s Price and Inventory Watch, starter home inventory has declined 20.4 percent year-over-year nationwide, which means buyers will have to shell out a little more dough to get their dream home.